Is This Chaotic Monkey Fitness Tracker Hidden in a Tech-Tattoo The Future Of Wearables? Its an unusual concept which brings together the seemingly disparate yet equally fashionable worlds of tattoos and wearable technology. Yet get ready for the rise of the ‘tech tattoo’, where advanced fitness trackers are ‘hidden’ in tattoos. Using an electroconductive ink, the tattoo is able to connect the sensors in the tattoo with the skin, in what is in theory a great fit. Fitness tracker using sensors need contact with the skin after all, and what better way then in the guise of a tattoo? In many ways its the ultimate camouflage for the tracker, and is much less eye-catching then a brightly coloured activity band which sits in plain sight on your wrist. The nature of the tat means it can be stuck anywhere on the body, which opens up the possibility of citing it in biologically more active areas of the body compared to say the wrist, which brings about heart rate reading issues, as we discussed here in the “science of heart rate monitoring”. So does the future of wearable tech lie in discrete sensors compared to the boldly coloured, standout devices that we see epitomising the market today? Certainly a lot of the underlying tech remains the same, with the wearable – in this case the tech-tat – leveraging bluetooth to talk to your smartphone. The sensors are able to read a raft of vital signs, including your temperature, perspiration and other such fitness stats such as your heart rate. However, Chaotic Monkey, the company behind the concept, see a raft of use cases which extend beyond the superficial worlds of fitness tracking. 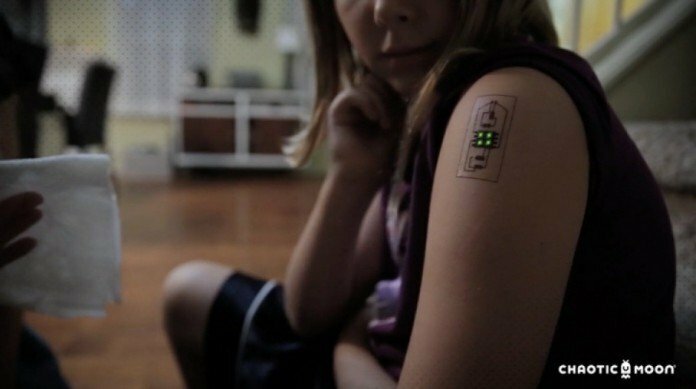 Bigger use cases include monitoring children’s health (possibly playing to the tats ‘cool factor?) and also monitoring soldiers on the battlefields. More discrete versions of their advanced biometric reader could be used by professional sports teams and athletes, discreetly passing key stats back to their coaches in real-time. Its long been theorised that professional sports will be driven towards a new age of professionalism by smart-tech and biometric devices, and such data could more accurately inform coaches of tired plays to initiate substitutions or even the possibility of muscular injury occurring.